After years of watching school districts around my own open up YouTube to their staff, students, and in some cases anyone using the public wi-fi, I finally pushed last year to do the same in my district. Our staff had always had access to YouTube, and our online students at the High School had access for their classes, but that was it. Teachers could use YouTube videos for whole group instruction, or post videos for use at home, but students were restricted to the Education version of YouTube while at school, a smaller portal of curated videos found on the platform that have clear educational value for the K-16 classroom. There are GREAT videos found in YouTube’s Education portal, but the reality is that YouTube has become so pervasive in our culture, that most of the videos our teachers want to use (and have been using) exist out among the general morass of YouTube videos. The hurdle we faced, and still do, is the need for teachers to have effective management strategies and techniques for dealing with a fully unfiltered YouTube in their classrooms. But just typing that last sentence makes me anxious for all of the teachers and parents that question unleashing YouTube upon our classrooms (I tend to over-empathize), and fret for how to effectively manage student behavior while watching YouTube videos. I want teachers and parents in my school district to feel confident that we are always developing and seeking out new strategies for using such an enticingly distractive, yet educationally wealthy, platform like YouTube. This book may or may not have saved my life on more than one occasion. I have a lot of knick-knacks and joke books in my collection of former teaching supplies that still occupy a small corner of my work area. 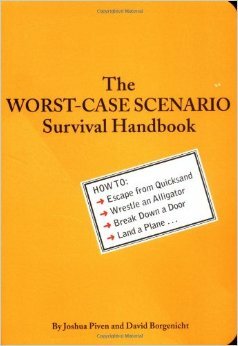 One of them is the Worst-Case Scenario Survival Handbook, given to me as a joke one Christmas (I’m a card carrying Eagle Scout). It was humorous to read a few of the stories to my old classes as an example of a “how to” manual that wasn’t some dry expository text. I’ve kept it around because I’ve had an idea to assemble a “Classroom Scenario Survival Handbook” for various realms of technology for some time now, and I thought starting with YouTube would be a good place to start.